PHOENIX – This parcel in the shadow of downtown high-rises once looked a lot like the area around it, with older buildings and limited shade. In 2009, however, it became Civic Space Park, where shade trees and grass provide a 2.8-acre oasis amid concrete and asphalt. “People want to see at least some grass in a park,” said T.J. Penkoff, Civic Space Park coordinator. 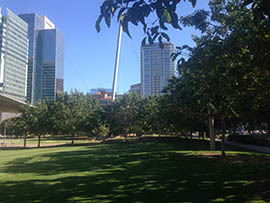 The park, which opened through a joint effort between the city and Arizona State University’s downtown campus, addressed a dearth of lush green spaces in the immediate area. “The city didn’t really have any green space right downtown,” Penkoff said. The impact of parks in the center city goes beyond simply designing a public space. Average temperatures have increased in the Phoenix area as concrete and asphalt from sprawling development retain heat. Penkoff said that temperatures can be 5 to 10 degrees higher downtown than in the desert outside the city. Moreover, temperatures may continue to rise. A 2012 study pointed to summer temperatures in Phoenix rising by up to 7 degrees Fahrenheit by 2050. “The impact of urban areas on warming is as important as greenhouse gas-induced warming in certain areas,” said Matei Georgescu, senior sustainability scientist at ASU and one of the authors of the study. Sandy Bahr, director of the Arizona chapter of the Sierra Club, said the rising heat could have larger consequences for the greater Phoenix area. “Overall, temperatures going up will make us more miserable,” she said. Bahr pointed to a potential increase in heat-related deaths and increased cooling costs, in addition to less-obvious problems like disruptions to monsoon patterns and harm to wildlife. Aaron Golub, associate professor at ASU’s School of Geographical Sciences and Urban Planning, said that one of the most important things Phoenix can do to limit warming is aggressively promoting shaded spaces to walk, bike and take public transportation. For Golub, that means planting shade trees. According to Golub, this process is already underway with Reinvent PHX, a collaborative partnership between the city’s Department of Housing, ASU and a mix of other private and public organizations that maps surface temperatures in neighborhoods around Phoenix. He noted that midtown Phoenix, with higher income levels and more trees, is noticeably cooler than the less-affluent Garfield District just east of downtown. Golub also noted that tree coverage in Phoenix has dropped noticeably in Phoenix as residents in central Phoenix move to gravel lots to save money on water — money he said they end up losing in cooling costs. The Sierra Club’s Bahr said she supports adding trees to cool neighborhoods but notes that there are desert trees, such as mesquite and ironwood, that provide shade while requiring relatively little water. “We don’t have to plant non-native trees and plants when there are shade trees exist naturally in the Sonoran Desert,” she said. Jon Talton, a journalist and independent expert on Phoenix history, said that planting trees in central Phoenix fits the environment. Talton describes central Phoenix as an “oasis,” and said that the green space is an important part of cooling the city. Civic Space Park is trying to fit into that tradition. While Penkoff noted that the park is too small to affect temperatures by itself, the space provides shade as well as a blueprint for additional green spaces downtown. “We see the park as providing a mouthpiece for downtown,” Penkoff said. Tree coverage and grass in Civic Space Park provide cooler green space near the heart of downtown Phoenix.